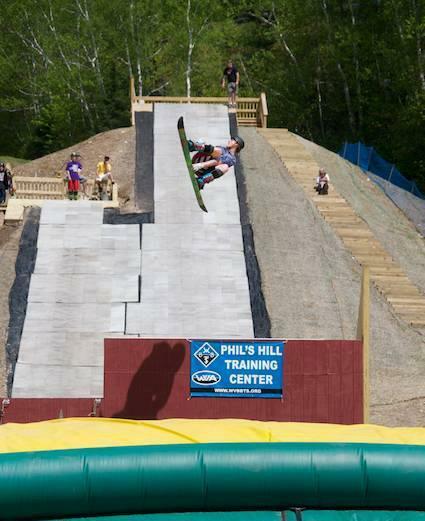 Waterville Valley, NH – Officials in Waterville Valley last weekend officially dedicated Phil’s Hill, a new year-round freestyle ski and snowboard training facility on the ski area’s Snow’s Mountain. Phil’s Hill features two in-runs covered in a dry slope snow-like surface, the longest of which is 170 feet long. Skiers and riders launch off a kicker and land in a giant airbag to cushion their landing. Similar facilities in Lake Placid, N.Y. and Park City, Utah, utilize a splash pool instead of the airbag. The Waterville Valley Black and Blue Trail Smashers (WVBBTS) will be hosting freestyle training camps throughout the spring, summer and fall at the new facility on Phil’s Hill.